DORNA HAVE LAUNCHED a rescue mission to combat the ever shrinking MotoGP grid offering a financial life-line to the fledgling Pramac Ducati team. The main area of the plan is cover the loss made by Suzuki dropping it's team to one rider for next season. With a helping hand from the Spanish organising body, the Ducati satellite team will receive a cash injection but with the stipulation to return Moto2 Champion Toni Elias to the premier class. 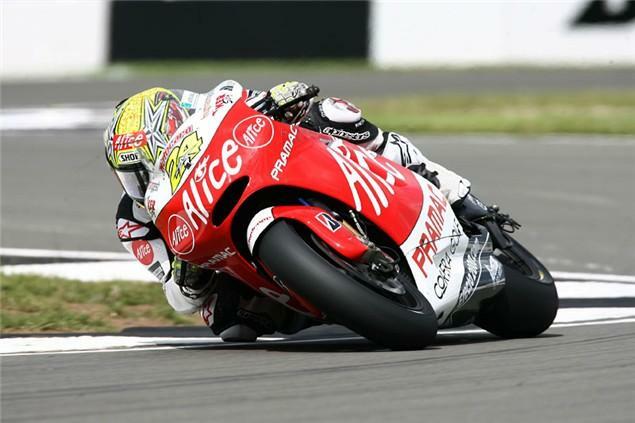 Pramac had originally been involved in negotiations with German Superbike rider Max Neukirchner, with a big-money sponsorship package involved. But plans fell through, and the team had decided to run only one rider next year – the newly contracted Capirossi - until now. One rider not linked to the plans is Aleix Espargaro. The Spanish rookie is expected to move to a top seat in Moto2, with assistance from Dorna. The decision to run a break-away factory Honda team has been quashed with news leaking in Spain that Repsol are to up their budget to 15-million Euros, to support the three-rider factory Honda team. This potentially saves another grid place. The deal relieves pressure from Gresini's San Carlo outfit from keeping a seat clear for Dovizioso on a factory bike. It is now expected that Hiro Aoyama will step in join his former 250 championship rival; his current Interwetten team is not contesting the class next year.